The Oakland boxer was one of the best ever. Now, he’s making a documentary about how he reached the top. When was the last time you heard of an athlete with a 20-year winning streak? Boxer and longtime Oakland resident Andre Ward suffered his last loss when he was 13 years old, competing as an amateur. When he retired as a 33-year-old professional last September, he’d amassed a record of 32 wins (16 by knockout) and no losses. “It’s just unreal. It almost feels like I’m not the guy that accomplished that,” Ward recalled in a recent interview. Through it all, “S.O.G.” (abbreviation for “Son of God,” in honor of his Christian faith) has proudly represented the Bay Area. Ward is an avid Golden State Warriors fan and has appeared in promotional videos for the team. He also holds frequent signings and appearances in the Oakland area to connect with his fans. He and his family also still live in the area. The road wasn’t remotely easy. Ward began boxing as a 9-year-old in Hayward when his father, Frank Ward, took him to a local boxing gym. In 2004, at the age of 20, he won Olympic gold. After turning professional, he won multiple world championships in the super middleweight (168 pound) division. 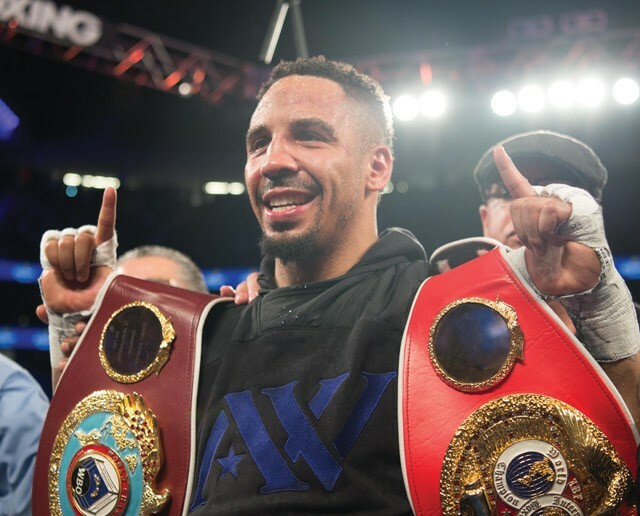 For his final two bouts, Ward moved up in weight to the 175-pound limit to defeat world light heavyweight champion Sergey Kovalev — twice. In the rematch, Ward won by a knockout. Outside the ring, Ward was endorsed by Jordan brand, became a boxing analyst for HBO, and appeared in the 2015 hit film Creed. But it’s been about more than achieving star status for Ward. He’s used his platform to give back to the community by working with organizations like Pay Away the Layaway, which helps families pay off layaway balances, and the Boys & Girls Clubs of Oakland to reach those most in need. He has also worked with campaigns like Knock Out Dog Fighting, which educates youth to help stop animal abuse. Ward has said that he “gave up a childhood” to pursue his sport. But while he took his difficult sport seriously, he ensured that boxing never became his entire life. He put his family and his faith first. Now, as a retired father of four (soon to be five), Ward is enjoying life with his children. “I have a lot of fun with my teenage boys,” he said. “I have two younger kids as well. We’re always joking, playing, wrestling. Now that he doesn’t have any fights to prepare for, Ward is keeping busy with his new line of S.O.G. sportswear as well as an exciting new project: a documentary film about his journey.